Danger lurks with the Forests of Kaidan... Traveller Beware! You came to Kaidan, escorting a merchant and the gift he carried, a gift meant for a powerful Kaidanese lord. Yet this gift bore a powerful curse, and now, unless you can reclaim the golden spear, you will be forever trapped in Kaidan. A dark path lies before you, full of wicked undead, vicious demons and unnatural warriors. To survive The Curse of the Golden Spear, you will need all of your skill, cunning and bravery. The third of a three part campaign, The Dark Path is an adventure set in the cursed land of Kaidan and is suitable for a group of 7th level characters. Drawing inspiration from Japanese folklore, and fully compatible with the Pathfinder Roleplaying Game, Kaidan is a land of horror and mystery. In Kaidan, demons stalk the land inhuman form, the dead seldom rest easy, and life is cheap. This adventure continues the story which began in The Gift and Dim Spirit, introducing players and game masters alike to the cursed realm of Kaidan. 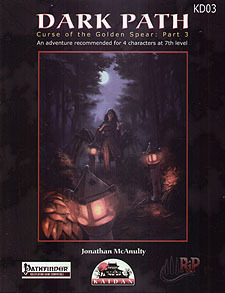 An adventure for 4 players of 7th level.